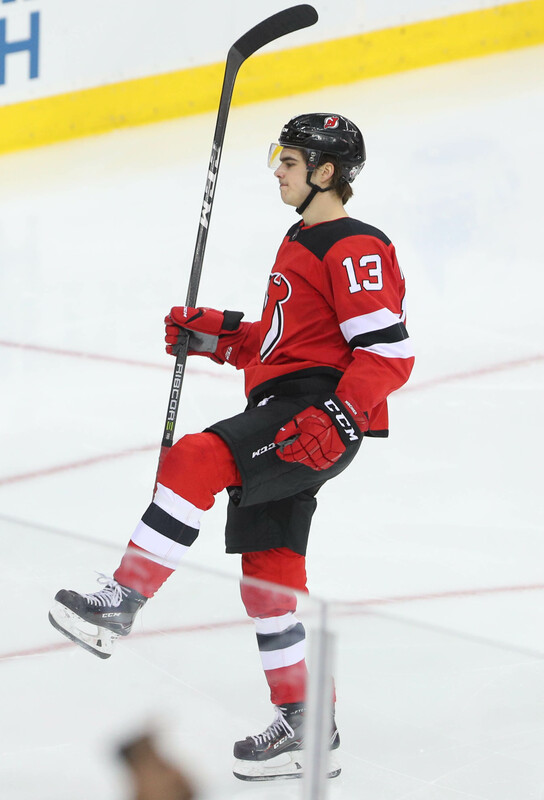 Hischier wasn’t among the rookie scoring leaders when all was said and done but the number one pick in 2017 still made his mark by finishing second in team scoring while ascending to a top-six role as a center quickly instead of being eased in as a winger. That should have him in line to potentially max out his Schedule ‘B’ bonuses ($850K) but he’ll have a hard time locking down the loftier Schedule ‘A’ one. He’ll be eligible for a contract extension next summer and it will be interesting to see if the Devils look to lock him up early or let him play out his contract and wait until the 2020 offseason to work something out. Bratt was a big surprise last season. Only one year removed from being a sixth-round pick, he wasn’t even on the radar to make the team but wound up playing over 15 minutes a night while providing strong secondary scoring. A repeat performance could make him an early extension candidate as well. Zacha has disappointed over his first two NHL seasons as he has to make much of an impact offensively. He has the size and skills to carve out a big role but has yet to do so thus far. Even if he rebounds next season, he’s a strong candidate for a bridge deal. Anderson has yet to play in the pros but New Jersey thinks highly enough of him that they burned the first year of his entry-level deal in mid-April without him playing even a single game. With that in mind, it’s reasonable to think they expect him to make an impact fairly quickly. As for Butcher, he made a strong impact coming over in free agency after declining to sign with Colorado. While he was sheltered (as many rookie blueliners often are), he made an immediate impact at the offensive end and is poised to take on a bigger role in 2018-19. He should hit at least some of his ‘B’ bonuses (also $850K in total) but the ‘A’ one is going to be out of reach. Johansson was New Jersey’s big acquisition last summer but concussion trouble limited him to just 29 games. When healthy, he is still a quality top-six forward capable of playing all three positions and a full season could help him land a nice raise on the open market. However, another injury-filled campaign could have him settling for a one-year deal next summer. Boyle’s start with the Devils got off to a rough start after being diagnosed with leukemia but he made an immediate impact upon his return and scored 13 times for the third straight year while winning the Masterton Trophy. It’s hard to see him really boosting his pay on his next deal, however, as he’ll be 34 and some teams are starting to look for cheaper role players now. Noesen had a career year last season which earned him a $1.125MM raise but if he takes a step backwards next season, he could become a non-tender candidate. Lovejoy was a regular in his first season with the Devils but was more of a depth player at times for them last year, spending a lot of time as a healthy scratch. That appears likely to continue as their back end remains intact which means that he will be taking a considerable pay cut on his next deal. Mueller missed over 30 games with a fractured clavicle and was also scratched at times which resulted in what’s basically a one-year bridge deal. If he’s in a similar role for 2018-19, he will be in line for another deal like that next offseason. Kinkaid’s case is particularly interesting. He re-signed last summer as someone without too much of an NHL track record. That changed last season as he got into 41 games, took over the number one job briefly, and posted numbers around the league average. That may not sound too exciting but a similar performance next year will still have him well-positioned for a sizable pay increase. Hall’s stellar showing last season has been well documented. The Hart Trophy winner shattered his career highs across the board and was a huge factor in them getting to the postseason. Even if he takes a step back next season, he’ll still be in line for a notable raise on an early extension. If he has a comparable performance in 2018-19 though, it’ll likely take putting him close to the league leaders in salary to get him to forego free agency. Vatanen wasn’t quite as productive as expected after being acquired from Anaheim but he was still able to step up and play a number one role. With the state of their back end, that’s going to be the case again next season which will be helping to make a case for his next deal starting with a six or a seven to be more in line with top-pairing players. Greene has become more of a shutdown player compared to a few years ago which makes his deal a little bit of a premium. Between that and his age (he’ll be 36 next summer), there’s a very good chance that he’ll be asked to take a pay cut on his next contract. Zajac’s deal was widely viewed as risky at the time it was signed (early in the lockout-shortened 2012-13 campaign) and while he has posted three seasons of 42 or more points since then, he hasn’t exactly rewarded New Jersey’s faith in him. He also has a full no-trade clause which could hinder any efforts to move him. Palmieri’s extension was also a bit of risk at the time as he had just one productive year under his belt, his inaugural season with the Devils. However, he has lived up to the billing and is giving them close to a top-line level of play for what is quickly becoming the price for second-line wingers. Coleman is just coming off of his first full NHL campaign and emerged as a capable bottom-six forward last year that can play both the wing and down the middle. If he can continue to hover around the 25-point mark, they’ll get a decent return for their money. Santini’s deal was just signed earlier this week and while he has only played sparingly at the NHL level thus far, he did average over 20 minutes a night in half a season last year. At a time where players like that are getting locked up for much more money, this is a deal that could become a real bargain if he’s back in a similar role over the next few years. While he struggled at times last year, Schneider is still viewed as one of the better starters around the league. He’s tied for the eighth-highest cap hit among goaltenders heading into next season which is about right. By the time this deal is up, he’ll probably be among the bottom half in AAV among starting netminders so this deal should still be a good one at the end of it. As for Severson, he took a small step back last season but still held down a top-four role. This contract was signed with the hope that he’d be able to build upon his 31-point showing in 2016-17 and they will be counting on him to do that starting next season. Even if he hovers close to the 24 he put last year though, they should still get decent value if he can stick on the second pairing. Worth noting is that this is a fairly back-loaded deal – only 22% of the total salary is paid in the first two years so if they decide to try to move him later on, the acquiring team will be taking on a fair bit more money than the cap hit by the end. Things are looking up for New Jersey. They have a decent young nucleus to work around with plenty of short- and long-term salary cap flexibility to lock up their core players while trying to add to it through trade or free agency (something they haven’t had a lot of success doing just yet). They will be in tough in the Metropolitan Division once again but brighter days are certainly ahead.